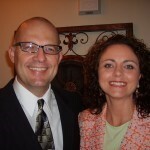 In early April, the Eagle Commission’s Dr. Larry Chamberlain and the FGBC Chaplain’s Endorsing Agent John Schumacher, along with their wives, will be visiting with Richard and Star Hurst. Richard is one of the FGBC’s newest military chaplains and will be graduating from Chaplains Basic Course on April 9. The Hursts are in the process of moving to Fort Drum, New York, for his follow-on assignment. Star was recently able to join Richard at Fort Jackson, having taken care of packing for the move to Fort Drum. “With your prayers,” Richard writes in an update, “Star has taken care of everything with no problems. Now, she is with me at Ft. Jackson and I am very happy that we can finally spend some time together before I go to Afghanistan in September with my unit. We do not like being away from each other but we realize that God has prepared our hearts for the sacrifices that must be made. “It has been all that I expected it would be in getting prepared to minister to our soldiers and their families. I do need your prayers for an injury while on an early morning road march at 0530 hours headed to our three-day field training exercise. While marching in the dark, I stepped into a hole and twisted my ankle chipping a bone and also fracturing my hand when I landed with all the equipment around 60 lbs on top of my hand as I tried to break my fall. I have a splint on my left hand and a brace on my right ankle. Prayerfully, I should recover in 2-3 weeks.